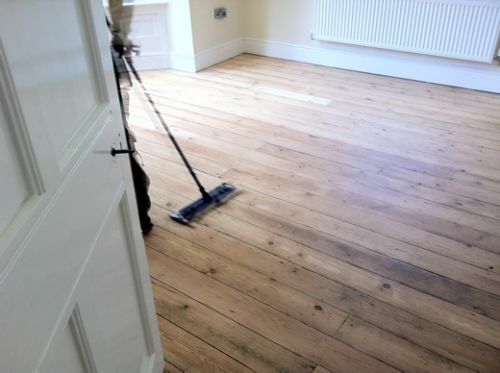 This photo set is from a completed wood floor restoration project for clients in Helsby in Cheshire. 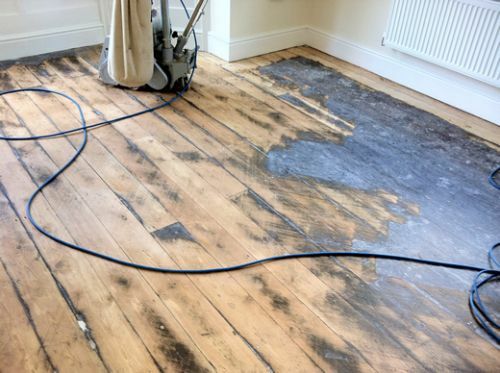 The Original Yellow Pine Floorboards, in this instance over a 100 years old were looking very much the worse for wear after being covered by a carpet for many years and had been painted with a black bitumen based paint decades earlier. 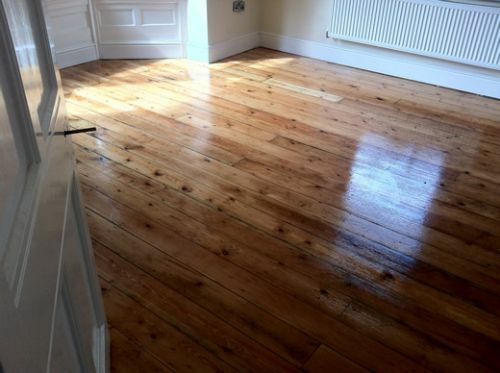 This paint makes the floor surface a lot more difficult to sand off cleanly, thankfully the floor sanded up quite nicely and after a lot of hard work on our part the Restored Yellow Pine Floorboards really did look superb. You Tube Channel, where you can view the video clips we took of this project in the 'before' and 'after' condition of the renovation. Thanks to Mr. Lawrenson for his kind hospitality over the course of a long day. Restored Yellow Pine Floorboard Renovation / 7 pictures only in this photo set. Yellow Pine Floorboards Pine Floorboards just after the sanding of the floor had started. 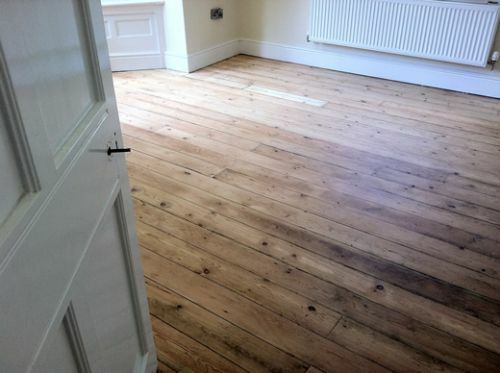 Yellow Pine Floorboards Restored in Cheshire Room from another angle. 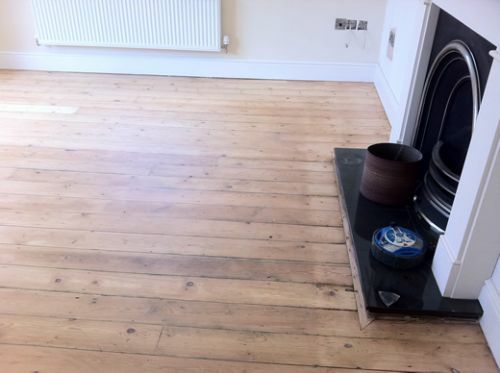 Yellow Pine Floorboards Restored in Cheshire by Woodfloor-Renovations The area is now being tack clothed prior to the lacquer being applied. 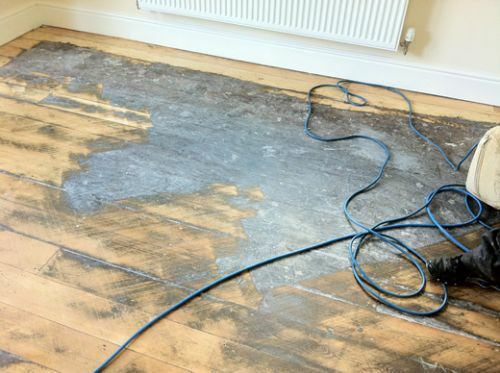 Floorboards Sanded and Sealing in Helsby, Cheshire by Woodfloor-Renovations The Pine Floorboards are now fully prepared and ready for the coats of lacquer to be applied. 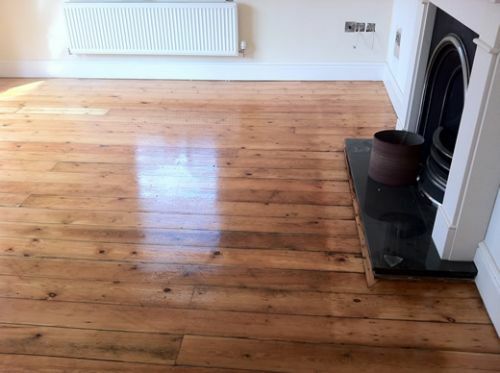 Yellow Pine Floorboards Renovated in Helsby Cheshire by Woodfloor-Renovations The Bona Mega Flooring lacquer has just been applied and doesn't the area look good. You Tube Channel take a look and let us know what you think. More Videos will be added ito our Channel in the near future.